Hello again it is I Elsie Wolfe. I hope you enjoyed the first blog? 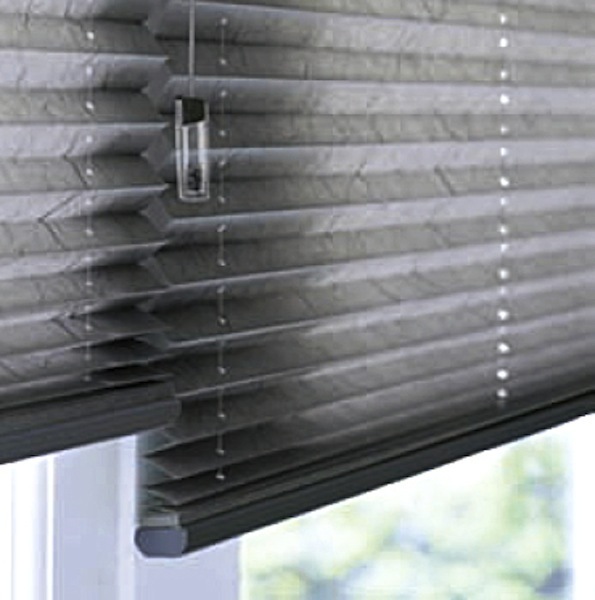 I have been busy this week hunting around the net to see what your big questions are surrounding BLINDS. Some of you are getting confused about which blinds are which, where they are best used and why aren’t yours doing what you thought they would.The main issues, from what I could see, tend to be with Roman blinds. I will address these issues as best as I can later. To begin with I will clear up blind classifications. 1. Roman Blind. Hand made, lined, black out or and interlined. Most fabric can be used to create. They come in several forms. Standard, Cascade, Waterfall and soft folding. Standard Roman with a pelmet. Even when up you can still see the folds due to tapes and fabric thickness when folding and there will always be a band of 10 / 12 inches, sometimes more when up, so light can be lost. Bigger gaps between the folds to make a feature when up, makes the blind even deeper. 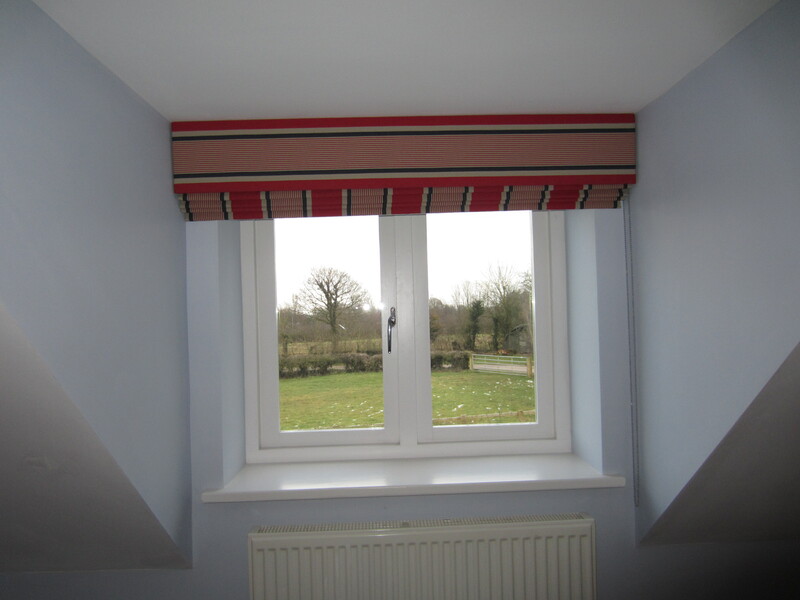 Has pleats even when down unlike all other Roman blinds that become flat when down. 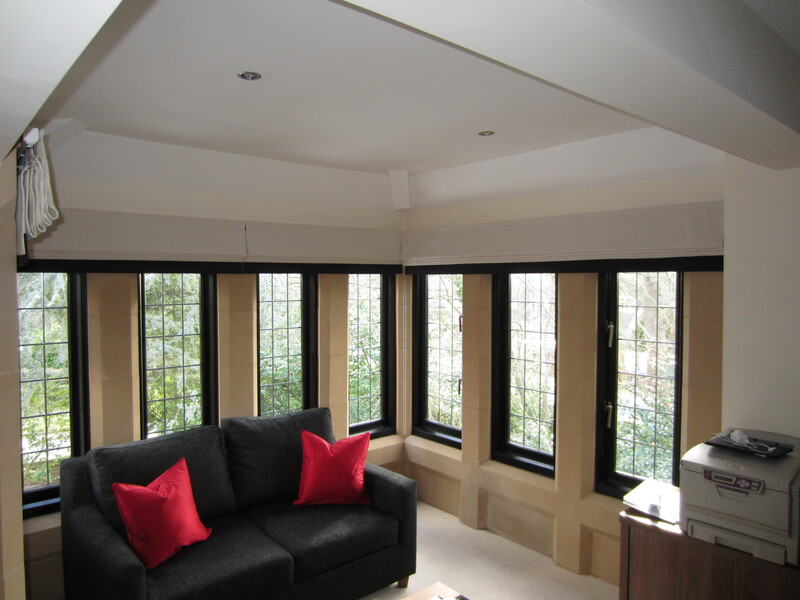 A more casual look created when there are no battens used to create the more classic ridged structured effect normally expected from a Roman. 2. 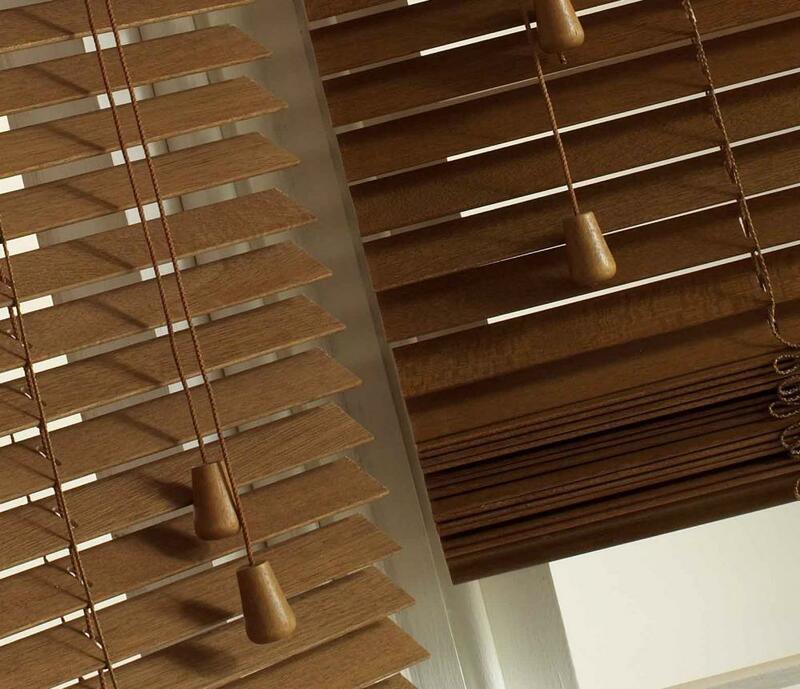 Venetian Blind Wooden or metal horizontal slats that can come in varying sizes, made using tapes or string to pull up the slats. Many companies make them such as Sundew, Sunway or Silent Gliss to name but a few. Wooden Venetian blind made with strings. 3. Plisse’ Blind Concertina style blind. 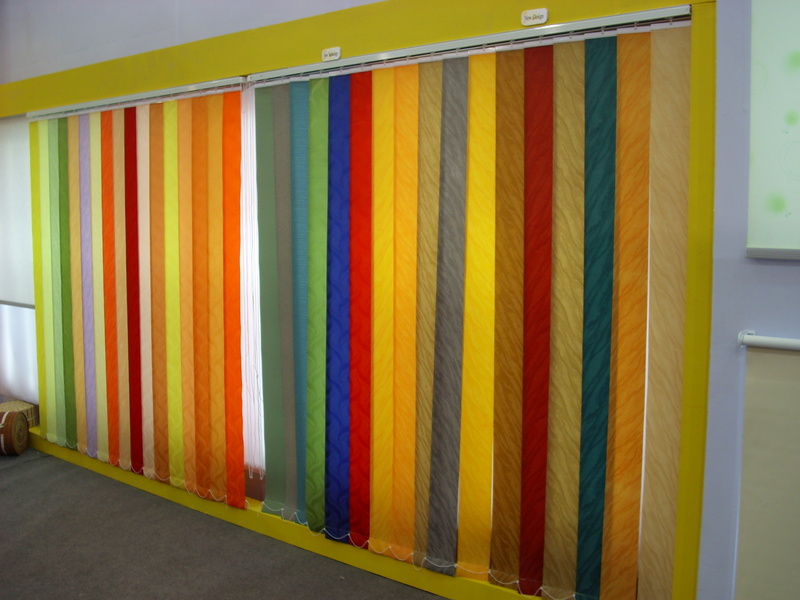 Companies only use there own specialist fabric in a single or double layer with wires to lift and lower. They can also be used to close up instead of down. Most companies, such as the ones above, make them. 4. Vertical Blind Vertical slats. Come in companies own cloth. My least favourite of the blinds but they do have some very practical applications. There have been recent developments, I have seen ones in wood! 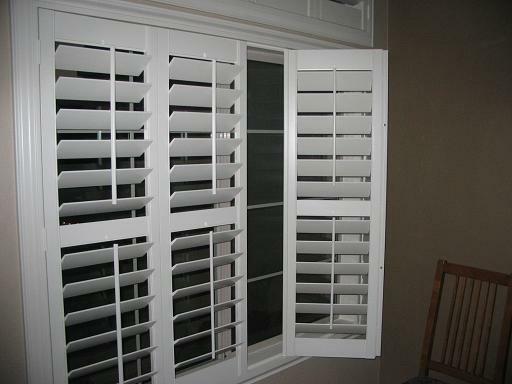 The slats or louvres twist open and close as well as sliding open to one or both sides depending on your preference. As you can see they come in many colours. 5. 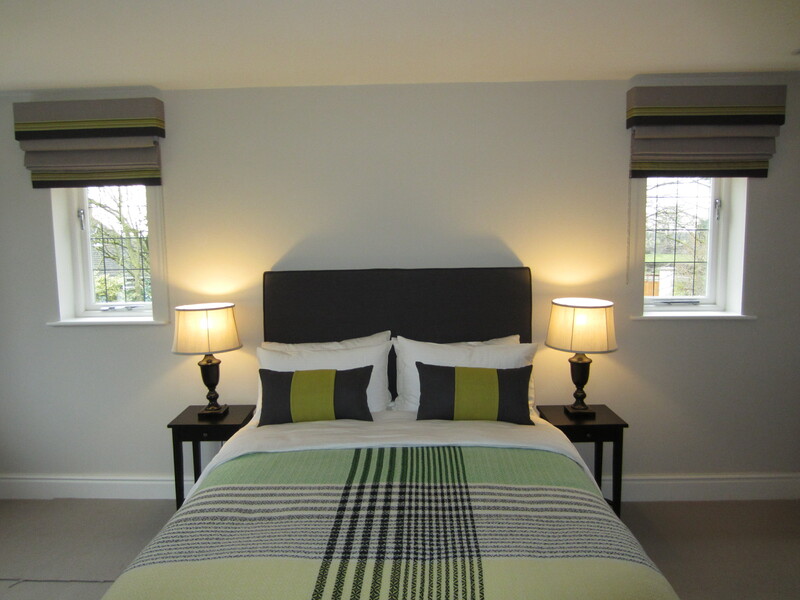 Plantation Shutters / Blinds Highly specialised product custom made. In wood or PVC. Slatted, in its own frame and can open and closed via slats or bi-folding. 6. Festoon and Austrian Blind Both very similar and blousy looking. You tend not see this style these days. Austrian blind folds drop out as blind is lowered but a festoon retains its folds. I must admit I am not a fan of this fussy look. Each to their own. 7. 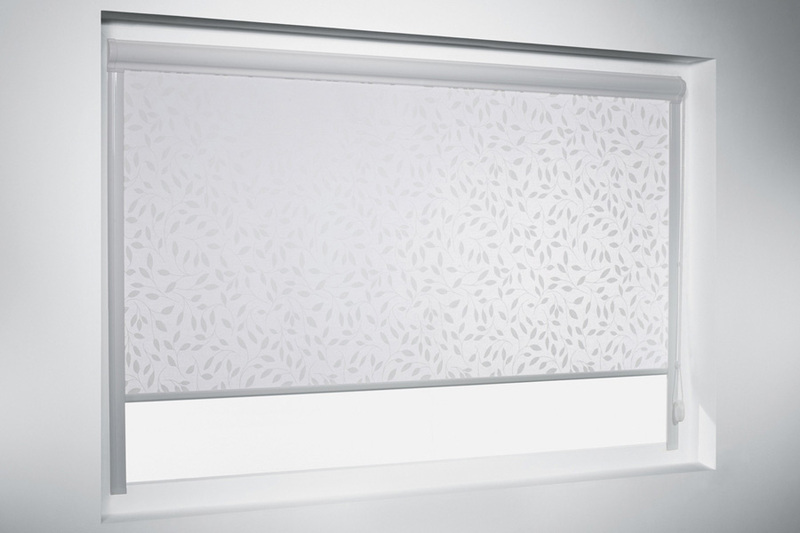 Roller Blind. As long as the fabric is flat and not too thick your choice of cloth can be used and treated to create a roller. In the main the manufacturers fabric is used. There are books full of purpose created fabric for this item. Be aware due to the brackets there will be big gaps at sides, so if you want black out completely you need one with a casement / its own frame. Left normal, right casement. 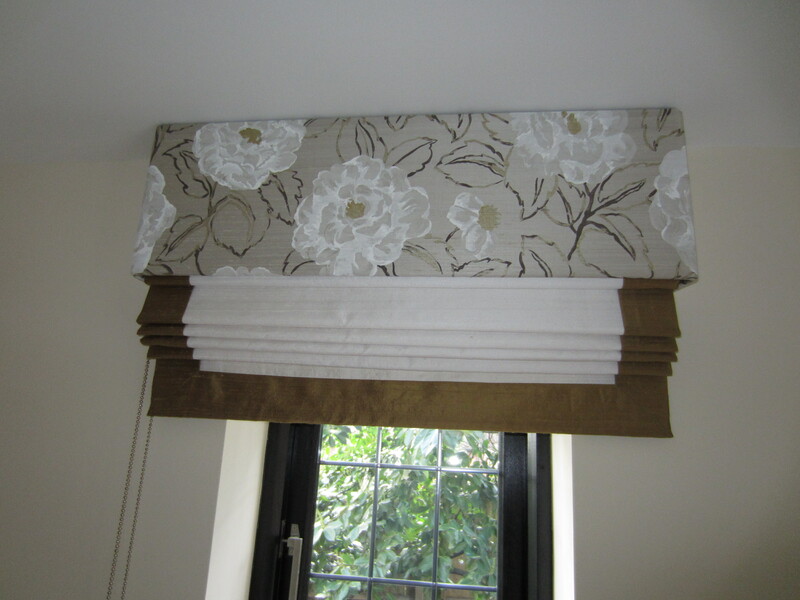 I recommend reverse rolling a blind to avoid handles and makes the roller at top more discreet. Hope this has cleared any confusion over blinds and their classification you may have had. 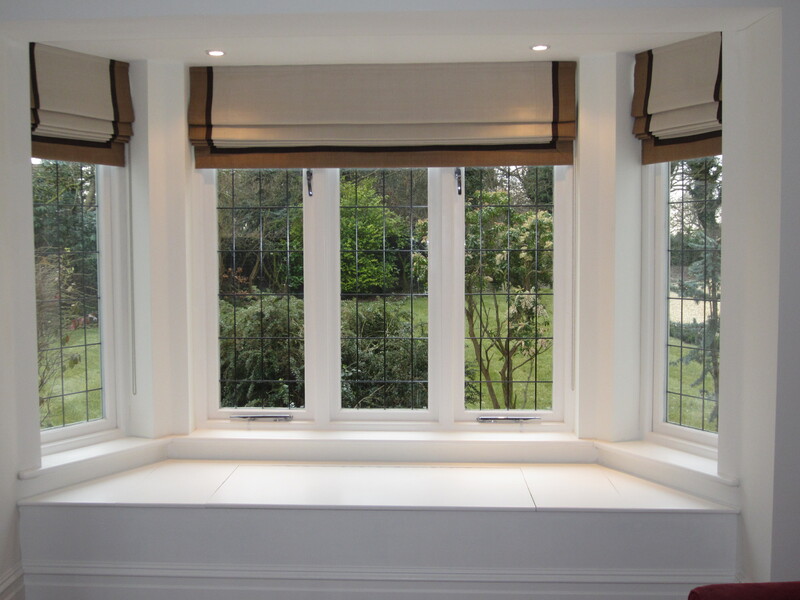 The following information is hopefully going to answer any questions or problems you may have with regards to Roman blinds. They are ones I have noticed cropping up on the net as well as surfacing in my career. 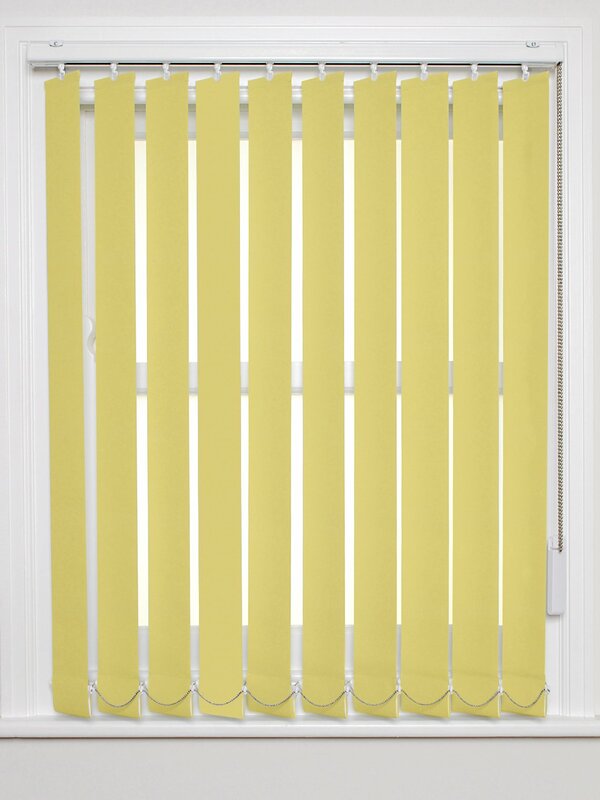 I have put images of blinds throughout. These are ones I have designed or ones I just like, I hope you like them too. 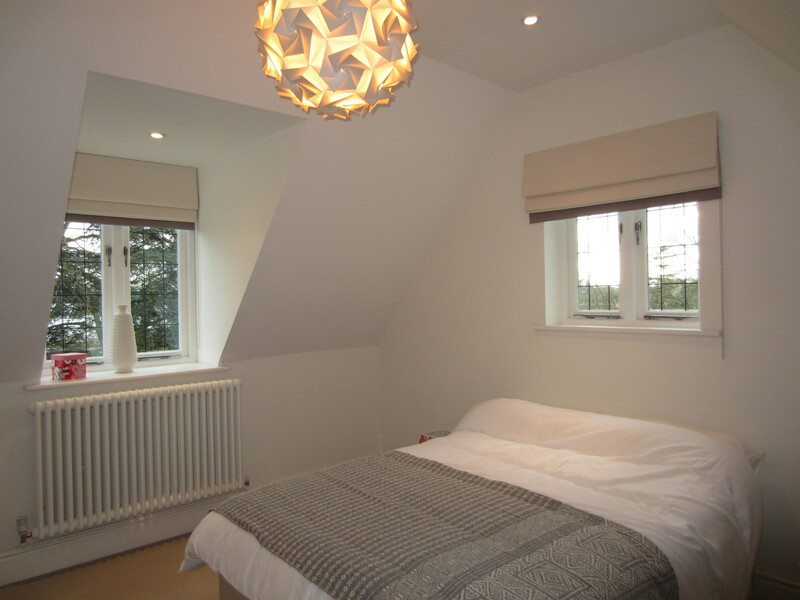 Before I delve into the world of Roman Blind trouble shooting I would like to tell you a little story of something that happened to me a few years back that I hope you enjoy and can take something away with you. I priced up some blinds for a friend of mine for her conservatory and gave her the best price I could. I included the cost for head-rails and fitting. My friend (very sensibly) got a few prices and found one cheaper with similar fabric, I could not lower my price further. I did ask her to check the quality of the lining, fittings and manufacturing. “Ask to see a blind they have made?” I recommended before she placed an order. I explained that even though I possibly was not the cheapest, I was one of the best and to make sure her pricing was like for like. I also said if the price is that much cheaper it will be for a reason and to make sure they were reasons that she was happy with. A few weeks later I received a call from my friend asking me to come and look at her blinds, I did. They were not very good at all, but not wanting to hurt her feelings I asked what she thought of them and was she happy. My friend was a little worried, she explained that there was something wrong with them but she didn’t know how or why that was. “They just don’t look right” she said. I explained that I did not want to pass comment before she had because the main thing was that she liked them but seeing as she did not I said I agreed with her, they were not right at all. I took out my tape measure and checked a few of them, inspected them fully, lifted and lowered. The person that she had ordered them from was coming round to chat about them and my friend wanted me to sit in. I was a touch uncomfortable with this but I said I would listen and advise after. The gentleman came. My friend reiterated her concerns and the gentleman said there was nothing wrong with the blinds. The fabric (a plain poly cotton) was not the best choice for a Roman and this was the look of them. Also that he would not recommend blinds this big. I was not happy to say the least! So I felt I had to speak up. I explained who I was and got out my tape measure explaining that the biggest problem was with the smaller blinds not being made straight so they would not hang or pull up straight, gaps between battens varied causing this. There was nothing wrong with the fabric that if it had been made straight there would have been no bellowing. The larger blinds would have been fine if a more substantial batten had been used as opposed to a flimsy plastic / carbon one. This would have stopped the bowing, also having more cord pulls to support the blind would have rendered more support. The man said he would take our comments, talk to head office and call us. They did not want to remake them and did not take the remaining balance off my friend in compensation. I personally would have asked for a refund because they were just not right, but the choice was my friend’s. Moral of the story. Go off recommendation, try and view a company’s product so you can see the quality before hand and make sure you are fully aware of what a product is going to look like as much as you can as well as understanding how it will function, before you purchase. Back to Roman blinds and how they work. There are 2 main systems. 1 = on a head rail with a chain pull. I personally recommend Evans or Silent Gliss . 2= the traditional cleat and acorn (you wrap the cords around a metal cleat on the wall). These can be helpful on some bays and situations where you do not want the blind to project too far forward. Even though it is a bit more expensive I tend to go for the rail in most situations. The rail does the work and not you so the blind lifts and lowers the same and not wonky. The rail also can increase the life of the blind. So many times have clients come in saying that the cords have snapped on the traditional version, this is mostly caused by misuse. Not pulling cords straight down, letting go of the cords causing the blind to drop abruptly and snap the cords. Not pulling cords all together causes the blind not pull up evenly. If the cords are pulled together but blind is still wonky it will probably be one of two things. 2. The blind has not been made straight (Potential remake). Most windows are not 100% true. 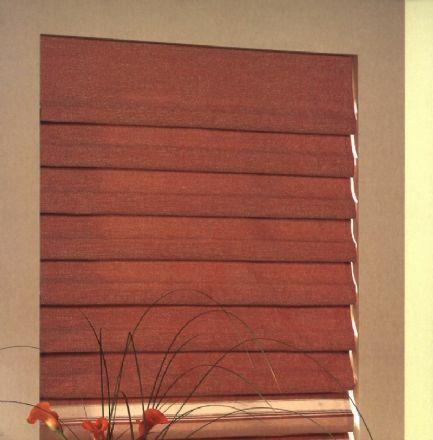 Blinds are made true so they function correctly. When a Roman is made the most narrow points of the window are used and a small deduction is taken again so the blind does not rub on the recess. This deduction causes some gaping (that may vary depending on the accuracy of the window). This in turn can cause light leakage on Black out Romans. On black out Romans you also get a row of pin dots, this can be reduced with interlining and stab stitching. Stab stitching the Roman reduces the quantity of holes and the interlining closes around the stitches reducing light leakage. Curtains on tops will assist also. Silk Roman inside recess. Outside curtains. 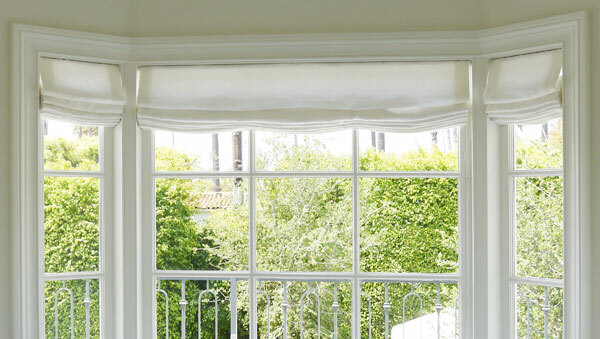 If you have a window that runs out a lot I would recommend putting the blind on the outside of the recess and hanging it past the sill if possible. Doing this hides the problem as well as taking less light off the window. I also feel if it is the only window dressing it finishes off the window better. Blinds in and out of a recess. VN Seville plain fabric. 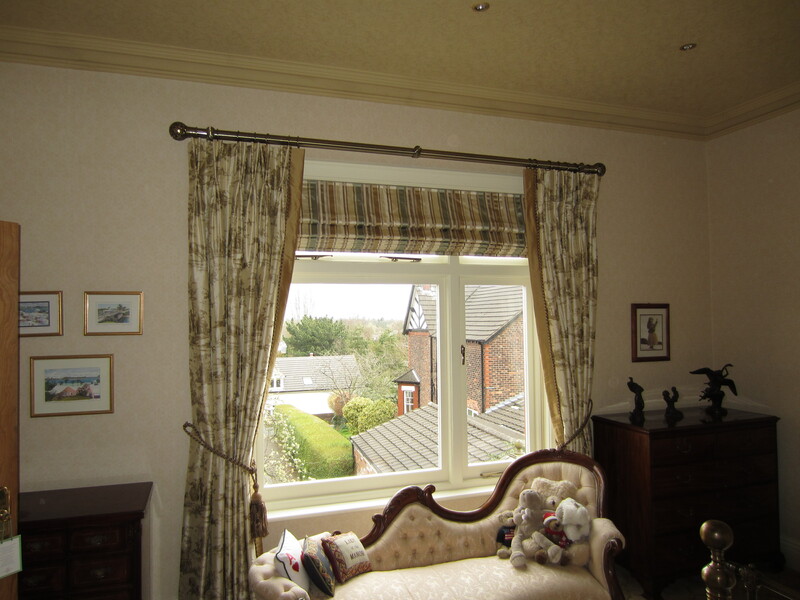 As you can see outside recess Romans look great especially with a pelmet. 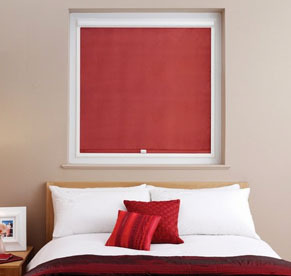 I feel Romans also look best in bays (better than any other blinds). They also work really well in box bays and bays where the blinds fit even closer than shown below. Swaffer silk plain. Double bordered. Good luck with your Roman blinds. Please email or leave a comment if you have any queries that are not covered in the above post and I will respond as soon as I can. Hope you enjoyed the post. I definitely like the simplistic look and ease of roller blinds. They can be rolled up and out of the way to allow in total light, or you can get blackouts and darken the room. I will have to talk with my friend about what fabric she used for her roller blinds. Thank you for the information! Thank you for reading Kiyel Williams. Yes the rollers do pull up well. Good luck with you choice. Thank you again for your comments, I am glad you found this blog helpful. I hope you enjoy reading my blog page. New Blog out on 1/04/16. Kind Regards Elsie Wolfe. 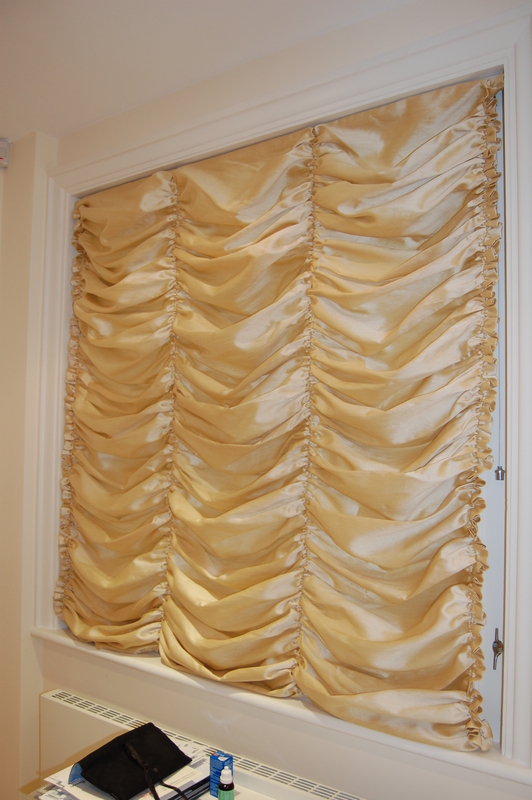 Hi Elsie, Please can you confirm the materials used on the Swaffer silk plain double bordered Roman blinds shown on your website? We would like to duplicate these in our house, thanks. I am a big proponent of plantation shutters. They look great, they are little kid friendly with no cords that can create a choking hazard, plus they can increase the value of your home! Absolutely. Also they look very smart and come in a variety of colours, not to mention I have seen leather and suede covered ones.